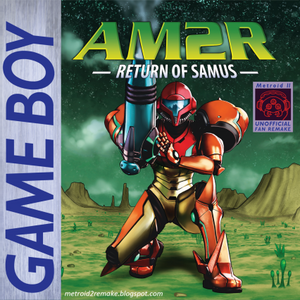 Another Metroid 2 Remake: Return of Samus is a free fan-made remake of Metroid II: Return of Samus for the Game Boy. 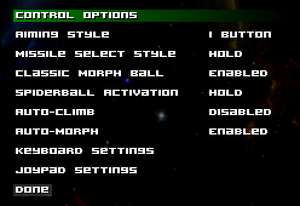 Features various control style options based on Metroid II: Return of Samus, Super Metroid, and Metroid: Zero Mission. No longer available for download due to Nintendo's DMCA takedown, preventing any future updates, bugfixes, and other platform releases. An unofficial patch, however, is available. Both Mac OS X and Linux versions are unofficially released. 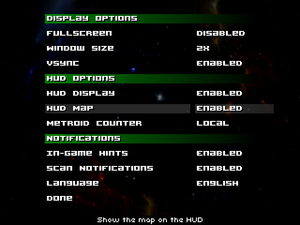 Wikitroid - A Wikia for the Metroid franchise. The soundtrack is available for free at higher quality than in-game here. Requires a zipped archive of the official v1.1 of the game (AM2R_11.zip) originally distributed by DoctorM64 prior to the DMCA takedown. New game modes, extra unlockables, and some of the planned but canceled features. Implements the remastered, high-quality soundtrack originally planned for a v1.2 update. Option for PlayStation and Nintendo SNES/Switch controller prompts; only applies to XInput-based controllers. Download the latest patch here. Extract the contents of this zip file to its own folder somewhere it can be easily accessed on your computer. Drag and drop the official AM2R_11.zip archive onto the Drag-and-Drop AM2R_11.zip onto Here!.bat file included in the patch. A prompt will also appear if you wish to install the remastered soundtrack during the patching process, if desired. After successfully patching the game, a new AM2R_* folder should appear where you extracted the patch's folder, containing the game with the latest patches. Save files from previous versions may not be compatible with the latest updates from Unofficial AM2R Patch. Upscales from 320x240 between 1x-4x or stretched to aspect-ratio in fullscreen using nearest neighbor scaling. Can be toggled with Alt+↵ Enter or from the Options menu under Display Options. For XInput controllers, movement is bound to both left analog stick and D-pad. For DirectInput controllers, movement can be assigned to either left analog stick or D-pad. Deadzone and analog movement option available. Numbered button prompts when using a DirectInput controller. For Nintendo button prompts, install Unofficial AM2R Patch, then go to Options → Display, then under Notifications set Controller Tips to Nintendo Pro or SNES Colored. Game switch dynamically switches between keyboard and controller prompts. No speech outside of ending. Following dependencies are required for Ubuntu/Debian distributions: libgcc1:i386 libgl1-mesa-glx:i386 libglu1-mesa:i386 libopenal1:i386 libssl1.0.0:i386 libstdc++6:i386 libx11-6:i386 libxext6:i386 libxrandr2:i386 libxxf86vm1:i386 zlib1g:i386.